Plank variations make this ab exercise effective and enjoyable. Don't let its looks fool you. There is more to the plank exercise than hanging out on your tippy-toes and forearms. After all, there is a reason this core-strengthening exercise is a staple in celebrity belly-busting workouts. It gets results -- the 360-degree type. The plank not only tones the abs, but also targets your entire torso -- front and back. This exercise targets both surface and deep abdominal muscles, as well, for taut abs. The plank will be a familiar exercise if you've been in a group fitness class or followed an exercise video. Its popularity comes from its ability to simultaneously tighten the abs, back and pelvic muscles. Not that many exercises can promise that. And once you're in position, you're done. There are no tricky moves. And no finicky hand or leg placements. Regardless of your exercise level, the plank is an ideal place to start for toning tricky-to-tighten abs. The plank move is serious business. Working from the pelvis up, this move energizes your core, making it an excellent ab exercise. The ways the muscle responds prove that. This move is ideal for toning the "washboard ab muscle" -- the rectus abdominis. This muscle starts at the pelvis and runs vertically, stopping at your sternum. But the muscle toning doesn't stop there. You'll feel the kinetic energy coursing through your transversus abdominis muscle -- the muscle deep inside your abdomen -- and your internal and external obliques. The internal and external obliques mark the sides of your abdomen and help define your waistline. Of course, the plank also works your erector spinae -- the muscles running along your spine -- as well as your middle back muscles, the rhomboid muscles, and your delts. The standard plank exercise is enough to warm up your core. However, to stave off boredom -- and to better target ab muscles -- mix it up. First, though, make sure you've mastered the basic plank. Start by getting to an all-fours position. Lower your upper body, bending at the elbows, and extend your legs backward. Come to your tip-toes, keeping your legs close together. Breathe as you form a tabletop with your back, and keep your hips from dipping or rising. Plank variations vary in style and form and include the side plank, pushup plank and the plank with donkey kick, just to name a few. Plank exercises can chisel your waistline by strengthening your core. However, weight loss requires eating a well-balanced diet -- rich in whole grains, vegetables and fruit, limiting your sweets, staying hydrated and performing cardio exercise. If you have layers of fat covering muscle, defining them won't pay off. According to MayoClinic.com, adults should get, at the minimum, 75 minutes of vigorous aerobic activity weekly to reduce their weight. As you do core-strengthening exercises such as the plank and start to lose weight, your hard work will show. What Equipment Is Needed for Plank Exercises? 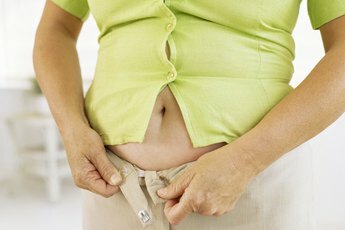 Can a Muscular Stomach Be Flat? 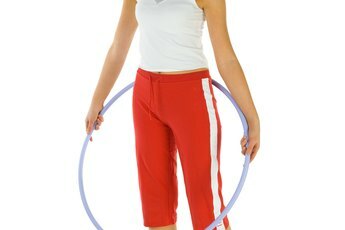 Is the Hula Hoop a Good Exercise for Firming & Reducing Your Waist?